Direct sublimation transfer printing requires the fixing of printed inks through heating. 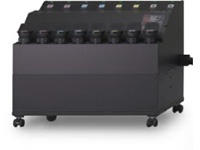 Previously, these processes were separately performed; The Tx500P-3200DS contains a heating device that allows simultaneous printing and color fixation. Further, in order to deliver optimum finish, the printer and the heater units are linked. 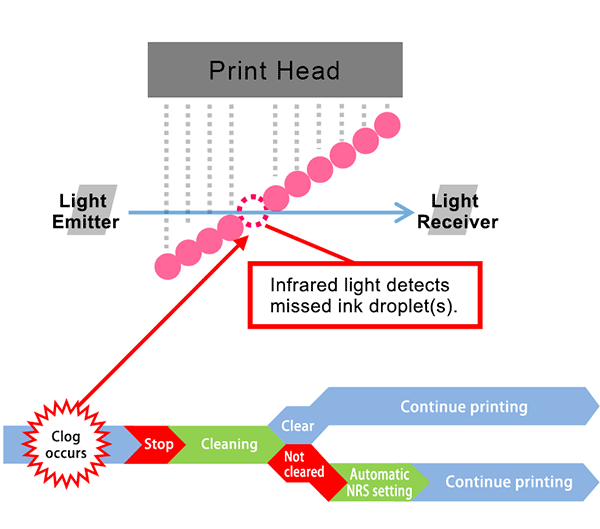 The printer starts printing when the heater reaches the optimum temperature. This novel feature considerably reduces production time and expands business opportunities by accommodating demands from sample creation to large-lot print production. "Tx500P-3200DS" can print on 3.2 wide polyester fabric. The super wide direct-to-textile sublimation inkjet printer is suitable for printing on increasingly popular large size soft sign and various home furnishing products. 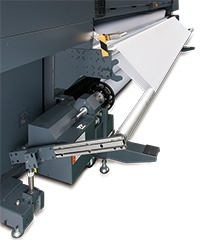 AMF*1 and VTTS*2 are installed in the feeding and take-up units to secure the stable textile feeding of the rolled media (width : 3.2 m, weight : 130 kg) and minimize textile shrinkage after heating. Furthermore, a pulling roller smooths polyester fabrics, which have the tendency to wrinkle. These features maintain an appropriate tension in the textile throughout the printing process to deliver beautiful print results. 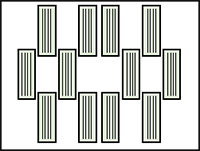 *1 The AMF applies an appropriate tension to the textile through a tension bar. *2 By pulling media down vertically, feeding errors are reduced, thus increasing print stability.